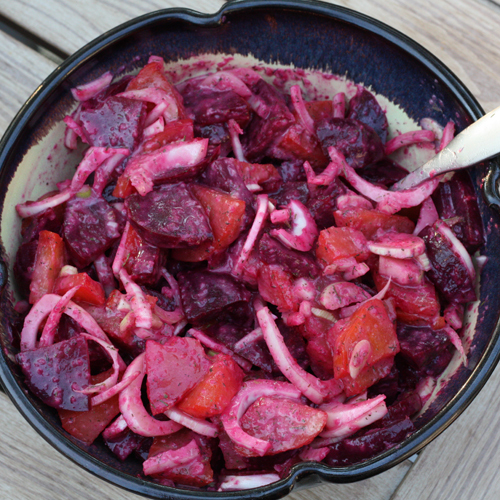 Balance Body & Soul Nutrition // Health Tips Blog // Beets & Fennel You Say? Beets & Fennel You Say? It’s been a hot summer, and if you’re anything like me you’re running out of creative ways to eat cold food. Don’t get me wrong, I love a good salad, but after a while, trying to find ways to create interesting things out of leafy greens and raw/cooked vegetables gets a little tiresome. Also, since we’re now entering the late stages of summer and encroaching on fall we are starting to see more root vegetables and squashes making their way into farmers’ markets and grocery stores. If you’re not ready to start roasting things in your oven yet, then this fabulous take on salad may just be the answer. Beets and fennel may seem like an unlikely pair. Both have very distinct tastes and it’s hard to imagine them playing nicely together in a salad, but trust me, this is delicious. I was introduced to a variation of this recipe by a classmate while still in school, and after adapting it to my own tastes it has become a favourite to pull out and pair with grilled or roasted chicken. The leftovers are great for lunch the next day with toasted sunflower seeds and a little goat’s cheese. Beets are ridiculously good for you, and for your liver in particular. But really, both beets and fennel are nutritional all-stars, along with the other simple ingredients in this salad. Fennel is related to carrots, celery, and parsley. It has a texture similar to celery, but the taste is more similar to anise or licorice. It is an excellent source of vitamin C, potassium, and fibre, and a good source of folic acid. It contains many trace minerals. Herbal medicine values fennel for being a digestive aid and it is often recommended to those who experience gas or cramping. It also contains phytoestrogens making it a valuable part of any female diet, especially for those feeling the symptoms of menopause. Beets are from the same family as spinach and chard, but unlike those greens, you can eat both the root and the greens of beets. Although beet greens have a higher nutritional value than the root, beetroots are an excellent source of folic acid, potassium, manganese and fibre. They are also a good source of iron, magnesium, and vitamin B6. The rich colour of beets is a result of betacyanin which is a powerful anticancer nutrient. Beets are most commonly known for their positive effect on liver function and are often used medicinally for disorders of the liver. Shallots are a member of the allium family and are related to onions and garlic. They are a good source of vitamin C, B6, and also chromium and fiber. Their sulfur compounds provide numerous health benefits, including blood sugar-lowering, slowing or arresting tumour growth, and easing the symptoms in asthma sufferers. Dill is an aromatic herb, related to carrot, celery, fennel and parsley. Like the other aromatic herbs, it calms and eliminates gas and other digestive upset and also has some anticancer and antimicrobial effects. Herbalists find it useful in promoting liver detoxification and some of its components can even help neutralize carcinogens. I highly recommend cooking the beets in advance (even a day in advance if you choose!) since you will need to allow them to cool before you can peel the skin off. This makes quite a bit of salad, and you will also have dressing leftover for salads later in the week. Step 1 – scrub beets well and trim the ends. Roast or steam them until tender (pierce with a knife to check – roasting beets takes 45-60 mins so feel free to do this step well in advance). Run under cold water and let cool. Rub the skins off. Step 3 – Slice or chop the beets and combine with remaining salad ingredients. Pour over desired amount of dressing and stir well to combine. Delicious cold or at room temperature. Enjoy!